In 1967, a businessman from Sherbrooke sets up a laboratory to repair hearing aid instruments. 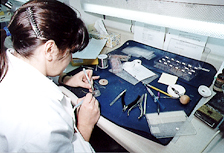 In 1970, after having experienced a moderate debut, the laboratory became an authorized service center for several major international manufacturers. In 1979, after undergoing one full year of research, development design and rigorous testing, the first Audio Controle hearing aid <the ACI 1> was launched and offered to professionals throughout Canada. In 1986, Audio Controle's team with its four highly qualified technicians, was able to offer five different models of hearing aid instruments, averaging an annual production of approximately 3 000 units. Experiencing a continued increase in demands for its different products, the company took on an expansion in the latter part of the 80's. Today, Audio Controle is proud to employ technicians and engineers supported by an experienced managing and sales staff. Audio Controle offers to its ever growing clientele, hearing aid instruments using the latest technology and responding to the specific needs of each individual. In the last few years, Audio Controle has continued its growth by shattering the North American boundaries and successfully entering the European and South American markets. Finally, in July 1996, we proudly announced that we were the first and only Canadian company, in the hearing aid industry, to receive the ISO 9001 certification. This international standard of quality is recognized throughout the world as the optimal sign of a company's respect for today's demanding market. This would not have been possible without the support of our customers, suppliers and personnel. Thank you! Audio Controle relies on four departments to produce its hearing aid instruments : Shell Production, Assembly of Electronic Components, Quality Control and Customer Service. These departments work interactively allowing the company to respond more rapidly and efficiently to the many simultaneous demands of the market. Efficiency, productivity and expertise are the key to our success. All of the components used in the production of our precision hearing aid instruments are carefully verified and tested with the latest and most efficient testing instrumentation. The assembly line is composed of highly qualified technicians whose knowledge is always kept up to date by a reliable continuous employee training. Our supplies only come from major leading international manufacturing companies in the hearing aid industry. With the implementation of a strict system of quality control (ISO 9001), we are proud to guarantee to our customers all the products manufactured at Audio Controle. Our well trained personnel is always on the look-out to respond to the clienteles needs and give a precise and fast customer service. For the past five years, Audio Controle's Research and Development Department has rapidly been growing. Having to perform within strict time schedules and very demanding guidelines, this department, consisting of a team of multifunctional individuals, is quite capable of taking on the challenge. Since our ISO 9001 accreditation in July 1996, each of our research and development projects is undertaken respecting the rigorous standards of quality control. Hence, Audio Controle can offer products of superior quality and answer the specific needs of the national and international markets.